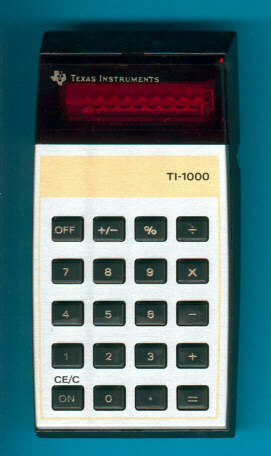 Size: 5.4" x 2.8" x 1.3"
Within one or two years after introduction of the TI-1000 the end of LED calculators was reached. Modern LCD-calculators outdated them due to their long battery life and thinner shape. Compare this LED calculator with the first TI LCD calculator, the TI-1750. Please note that later models of the TI-1000 got a silver trim around the keyboard instead the earlier golden design. More differences could be found inside the calculator! Calculators with different nameplates were sold from Western Auto as Citation. Don't miss the educational game "Spass mit Zahlen" based on the TI-1000.